Geneva – IOM, the UN Migration Agency, reports that 133,640 migrants and refugees entered Europe by sea in 2017 through 20 September, with over 75 per cent arriving in Italy and the remainder divided between Greece, Cyprus and Spain. This compares with 300,767 arrivals across the region through the same period last year. 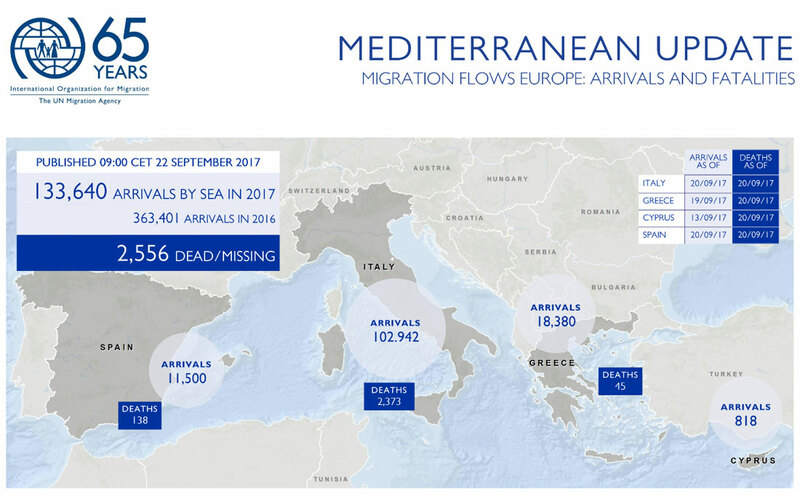 IOM Rome reported on Thursday 21 September that, according to official figures of the Italian Ministry of Interior, 102,942 migrants have arrived by sea this year, which is around 21 per cent fewer than arrived by this same time last year (see chart below). IOM’s Flavio di Giacomo cited reports that Libyan authorities have confirmed a shipwreck has occurred off the Libyan coast, causing the death of an estimated 100 migrants. The total number of fatalities for the moment has not been confirmed by IOM; therefore, no fatalities data has been included in today’s tables. IOM Libya’s Christine Petré reported late Thursday that on 20 September, 40 migrants were rescued off Zuwara by the Libyan Coast Guard. Among the rescued migrants were five women and one child. The migrants come from Guinea Bissau, Mali and Senegal. Three of the migrants were transferred to Zuwara hospital. She added the remains of seven migrants were found in connection with this rescue operation. So far this year, 16,567 migrants have been rescued in Libyan waters. IOM Athens’ Kelly Namia on Thursday (21 September) reported that according to the Hellenic Coast Guard, there were at least five incidents off the islands of Lesvos, Samos and Chios this week that required search and rescue operations. The Hellenic Coast Guard managed to rescue 216 migrants and transferred them to the respective islands. Namia further reported that migrant arrivals to the Greek islands total 3,310 for the first 19 days of September, putting this month on track to be 2017’s busiest on the Eastern Mediterranean Sea route. In August, migrants and refugees entering Greece by sea in August reached 3,665 – a number likely to be surpassed in coming days. Ana Dodevska of IOM Spain reported Thursday (21 September) official data from Spain’s Ministry of Interior indicates that as of 11 September, the total number of arrivals by sea to Spain was 11,162 with another 4,311 arriving by land. That represents an increase of 88.1 per cent from the previous year. Adding new sea arrivals of 338 between the dates of 12 and 21 September brings the unofficial total of sea arrivals this year to 11,500, which compares to 8,162 through all of last year. Deaths of migrants in Spanish waters this year total 138 men, women and children, ten more than were recorded through all of last year. Worldwide, IOM’s Missing Migrants Project (MMP) has recorded 4,002 migrant fatalities in 2017 as of 20 September. This marks the fourth straight year MMP has recorded at least 4,000 migrant fatalities worldwide. The 4,000+ benchmark was reached last year on 3 June and on 27 August in 2015. In 2014 the mark was reached on 2 October. Since last week, MMP recorded eight fatalities on the Haiti/Dominican Republic border: eight Haitian migrants drowned when crossing a river. So far, only two bodies have been recovered, while six migrants remain missing. In the Central Mediterranean, more than 100 migrants are feared dead in a recent shipwreck off the coast of Sabrata, Libya: this incident is not included yet in the figures below. Additionally, MMP received survey data from the Regional Mixed Migration Secretariat’s Mixed Migration Monitoring Mechanism Initiative (4Mi) for the period June-August 2017. The 4mi project interviews migrants in transit from West and East Africa and includes questions on deaths witnessed during their journey. According to findings from the 4Mi surveys, MMP recorded 122 deaths in Sub-Saharan Africa, 14 in the Horn of Africa, and 77 in North Africa between June and August 2017.